Kathy McVay is a CAFOD supporter from Sacred Heart parish, Bristol. 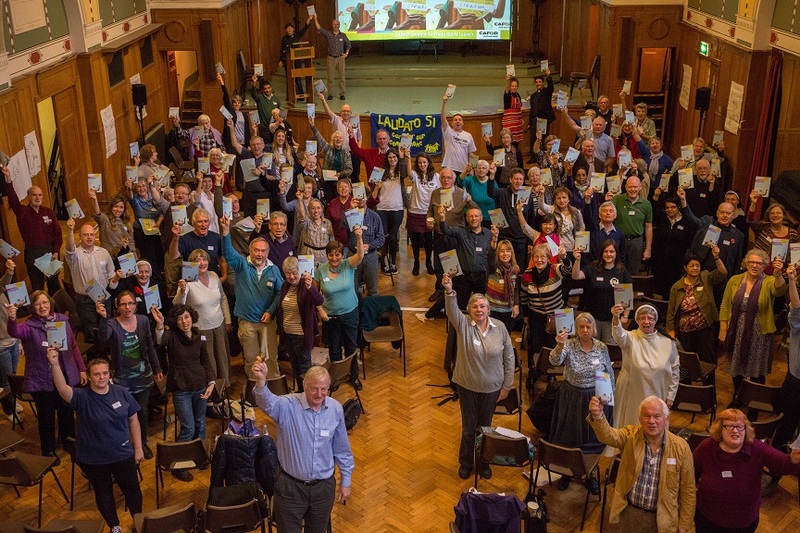 Kathy reflects on her experience of reading Pope Francis’ encyclical, Laudato Si’. Laudato Si’ is a paean to God’s creation: humankind, other forms of life on earth, the earth itself, our whole planet. And it is a plea to all people to stop destroying it. Like the majority of scientists (Pope Francis has a background in chemistry), the Holy Father fears that we are destroying our planet, chiefly by creating climate change. He believes that it is a very real threat to poorer countries who are trying to develop, and also to our children and grandchildren. This interconnectedness between humankind and the elements is a theme that runs throughout the encyclical. Chapter one is partly a factual account of what is happening to the earth; pollution and climate change, waste and the throwaway culture, the issue of water, the loss of biodiversity. He links these issues with a decline in the quality of human life, the breakdown of society, and global inequality. Chapter two, entitled ‘The Gospel of Creation’ includes a wealth of stories from the Old Testament which support the idea of God the Creator. “God’s love is the fundamental moving force in all created things:” #77 and we are drawn “into the act of cooperation with the Creator” #80. Francis then looks outward towards the universe. Again the Bible offers much: “By the word of the Lord, the heavens were made” (Psalms 33:6). God has written a precious book, whose letters are the multitude of created things present in the universe”. (John Paul II). Again, he emphasises the interdependence of creatures. We should have a sense of deep communion with the rest of nature, but we cannot do that if we continue to tolerate that some people consider themselves more human than others, as if they had been born with greater rights. I will leave you to discover the delights of the Pope’s choice of references in the New Testament, which show that Jesus lived in full harmony with creation. And now I will add two incidents of my own choice, which show the same thing. The first is the cure of the man who had been blind from birth. In this miracle Jesus draws on two elements, earth and water. After telling his disciples that neither the man nor his parents had sinned, Jesus “spat on the ground, made a paste with the spittle, put this over the eyes of the blind man, and said to him, ‘Go and wash in the Pool of Siloam’ (the name means ‘one who has been sent’). So he went off and washed and came back able to see” (John 9:6-7). Another insight is after the Resurrection, when Mary of Magdala saw the empty tomb (John 20:11-18). Admittedly, Mary was weeping and that would diminish her eyesight. But it still seems strange that she thought Jesus was the gardener. I think he must have picked up some gardening tools and started to use them when he emerged from the tomb, or maybe he was bending down, looking at some plants when Mary first saw him. Maybe he had his back to her when she first saw him, which was why she didn’t recognise his voice. I wonder what you think? The remainder of Laudato Si’ is devoted to forward-looking strategies and plans for dialogues with a variety of bodies and organisations. In fact, the Pope said that he was writing this letter to everybody on the planet. I have really enjoyed reading this encyclical, and would put it in my top five books that I always have near me.